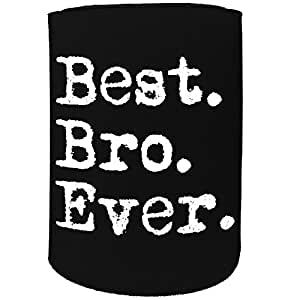 123t Stubby Holder - Stubbie Holders Cooler Best Bro Ever Brother - Funny Novelty Birthday Gift Joke Beer Can Bottle Koozie Coozie gift present- Stubby Holder made for Stubby bottles or cans made from Neoprene to keep your drinks cold. Professionally produced with an adjustable strap to fasten so that you can have it tight on any size of can and bottle. Exclusively printed for 123t. Although cheaper items may be available elsewhere, the quality of our items and production techniques are unparalleled. So while the price may be a little more expensive, we're adamant our assurance of quality is worth spending that little bit extra.